Taylor Swift had some trouble on Sunday at the Academy of Country Music Awards. Despite being nominated for four awards, she came away empty-handed. Gold goddess! Swift looked stunning in a long gold Dolce & Gabbana gown with an embellished neckline. Below is one of Taylor Swift's red carpet looks which I loved very much! Taylor Swift shows off her date, Kevin McGuire, at the 2013 Academy of Country Music Awards held at the MGM Grand Garden Arena on Sunday night (April 7) in Las Vegas. The 23-year-old country singer invited Kevin, a cancer survivor, to last year's show after he asked her to be his prom date. Unfortunately, his health was bad at the time and he couldn't make it, so this year the Academy flew his entire family to Vegas for the show! 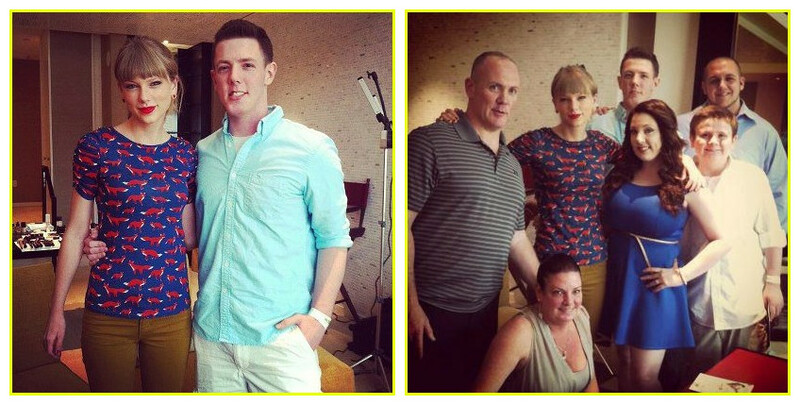 Over the weekend, Taylor met up with the family to hang out and spend some time together.